Afreen Afreen has become the first Pakistani song to cross the 200 million views on YouTube and it is the first ever Pakistani origin song to reach this milestone. The beautifully crafted ‘Afreen Afreen’ sung two decades ago by the legendary, Nusrat Fateh Ali Khan still holds the strength to serenade the audience with its poetic and soothing sensibilities. The reformation of the track on Coke Studio – arranged by Faakhir Mehmood and performed by Rahat Fateh Ali Khan and Momina Mustehsan – transforms the Qawwali seamlessly into an unplugged track. Within the genre, the atmosphere of the song remains ambient and acoustic, as the bare minimum elements give room to Rahat’s majestic vocals to improvise the mastery he possesses. 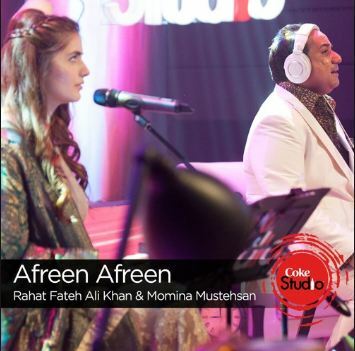 Afreen Afreen was Momina Mustehsan’s coke studio debut song and it had crossed 2.5 million views in one day. This song has even broken the record of another Coke Studio song sung by Atif Aslam, “Tajdar e Haram” 182 million views record back in November 2017. Here is a celebration of achieving the 200 million views milestone by Rahat Fateh Ali Khan and Momina Mustehsan. Afreen Afreen Unplugged!! #RahatFatehAli Khan and #MominaMustehsan celebrating 200 million views of #AfreenAfreen on YouTube , which becomes first ever Pakistani song to cross this milestone. Pakistani music has always been growing, now more than ever due to platforms like Pepsi battle of the bands, Nescafe Basement and Coke Studio.